The National Chairman of the Peoples Democratic Party (PDP) Uche Secondus opened a jar of warms on Monday when all of a sudden, developed a conscience by apologizing to Nigerians in the interest of himself and his members for the 16 years of mismanagements. Secondus in his expression of remorse said they were people and accordingly were to commit errors. He, in any case, guaranteed Nigerians that the party had developed and gained from its mix-ups and is prepared to do things differently if it came back to control. “I hereby, as the National Chairman, do admit that the PDP made a lot of mistakes; we are humans, not spirits and the ability to admit is key in moving forward. “We admit that we have made several mistakes; we have passed through all our challenges and have acquired the experience no other party can boast of; we were sanctioned by Nigerians at the polls in 2015; let me use this opportunity to apologise for our past mistakes. “It is the honest thing to do, a legacy to transfer to our children; we cannot continue like that. When we make mistakes, we should come out boldly to the people and apologise. It is important to do so because we have learnt from our mistakes unlike the All Progressives Congress (APC) that will make mistakes and lie to cover it. “We apologise to Nigerians that we have made mistakes, we have learnt our lessons and we are ready to begin on a new agenda; experience is the best teacher, no other party has it. When things are not positive and the mindset is negative, ”it is then time to reset it”, Secondus said. The remorse set off a response from the Presidency who believed that the PDP ought not to only apologize but be willing to return the stolen public funds. Scarcely days after, another exceptional reaction exuded from the President Muhammadu Buhari’s media aide, Garba Shehu who portrayed the expression of remorse as “under fair”. Garba claimed the PDP apologized for its edgy move to regain power in 2019, including that the party never again have access to national assets for its private use. “Even desperate thieves apologize because they are caught and not because they are incapable of repeating the crime if they had another opportunity,” the statement said. “We believe that the PDP should not only apologize for the imposition of candidates, and the culture of impunity, but must also come clean and acknowledge that they participated in large scale corruption and massive diversions of public funds to private pockets while poverty was ravaging the ordinary Nigerians,” the Presidency said. Lai Mohammed in his usual style took a step forward to list the names of PDP members on Friday as: the National Chairman (PDP) Allegation: On the 19th of Feb 2015, he took N200 million only from the office of the NSA. Former PDP Financial Secretary. Allegation: On the 24th of Oct 2014, took N600 million only from the office of former NSA. Former National Publicity Secretary Olisah Metuh. On trial for allegedly collecting N1.4bn from the office of former NSA. Dr Raymond Dokpesi, Chairman of DAAR Communications. On trial for allegedly taking N2.1 billion from the office of the former NSA. Former SSA to President Goodluck Jonathan, Dudafa Waripamo-Owei On trial, over N830 million allegedly kept in accounts of four different companies. Former President Goodluck Jonathan’s Cousin Robert Azibaola On Thursday, a Federal High Court ruled that he has a case to answer for allegedly collecting $40 million from the office of former NSA. “Former NSA Sambo Dasuki: Based on EFCC investigations and findings alone (this is beside the ongoing $2.1 billion military equipment scandal), a total of N126 billion, over $1.5 billion and 5.5 million British Pounds was embezzled through his office. “Former Petroleum Resources Minister Dieziani Alison-Madukwe: In just one of the cases the EFCC is investigating involving her, about N23 billion is alleged to have been embezzled. The PDP National Chairman Uche Secondus gave the Minister 72 hours to withdraw the statement or be ready to explain it to the court. “We shall within 72 hours from today, proceed to a court of competent jurisdiction to ventilate our clients right under the law and shall further seek the protection of the court against you”. Secondus said. “This kind of action can only diminish the government’s ability to fight corruption, frustrate its oft-expressed goal of a transparent governance, allow suspected perpetrators—whether from the All Progressives Congress (APC) or the Peoples’ Democratic Party (PDP)–to escape justice, and ultimately, deny victims of corruption justice and effective remedies.” SERAP added. The APC is as of now on what possibly named “heat period” as the party is experiencing strain from Nigerians who believed they had performed below expectations for the three years of rule. The criticism from the Transparency International hasn’t helped proven otherwise as the corruption index punctured a gap in the affirmed advance report announced by the Presidency. In the present administration, Nigeria is additionally evaluated as one of the poorest nations on the planet which additionally brace that cries by numerous Nigerians that the present government had denied them of the social status they had amid the last administration. 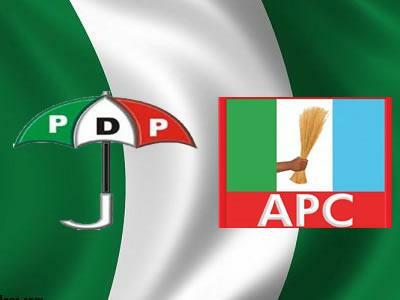 Individuals from the Peoples Democratic Party opined that the APC is edgy to paint the party badly as 2019 methodologies. This was contained in a statement by the former National Publicity Secretary Chief Olisa Metuh who is at present facing charges for supposedly collecting N1.4bn from the office of a former NSA. Metuh reacted to Lai Mohammed after he included him on the rundown of thieves. According to the former NPS, the APC had subjected him to twofold trial, on the media, and in the courts. He said the All Progressives Congress, APC, had turned out to be frantic because of the challenges in government as he noticed that the ruling party was currently resolved to paint the PDP to guarantee that there was no compelling resistance in ahead of the 2019 general election. Also, the National Publicity Secretary, Kola Ologbondiyan depicted President Muhammadu Buhari as poser who declined to scrutinize the sources of funds prior to and in 2015. In spite of the fact that Buhari burned through billions to run his campaign however he couldn’t afford to purchase the presidential form of N27.5m. Olagbondiyan asserted the cash originated from defilement proceeds, especially from the APC governors. “If the federal government and the APC are serious about fighting corruption and not just out to persecute PDP members, they should have began with the probe into the source of the billions of naira used for President Buhari’s 2015 presidential campaigns, particularly in the face of allegations that the fund was looted from treasuries of various APC states. “The PDP ask: Can President Buhari in all honesty claim ignorance of reports in the open media that a South-South governor looted several billions from his state accounts and diverted the sums into Buhari’s 2015 campaigns? “Can the Presidency and the APC inform Nigerians what steps the federal government has taken to investigate this allegation, which has been in public domain and to clarify their roles as beneficiaries of the alleged looted funds? “If they are not complicit, why are they not demanding the truth in the matter and the possible refund of the fund for the good of the people? “We challenge President Buhari to tell Nigerians what he has done regarding the leaked memo showing N9 trillion ($25billion dollars) corrupt oil contracts at the NNPC as well as the alleged stealing of N1.1 trillion worth of crude oil, all in a sector under his direct purview as minister of Petroleum. Reno Omokri a former aide to the former President Goodluck Ebele Jonathan released a list titled “The Real Looters List That Buhari and Lai Mohammed Do Not Want You To Know About” on Monday morning. The rundowns are individuals from the APC who are as of now arraigned with not an indictment to be seen in sight. He asked why the APC declined to disclose to Nigerians that the President is a recipient of the assets professedly stolen by the previous National Security Adviser Colonel Sambo Dasuki. Rotimi Amaechi: Indicted by the Justice George Omeregi led Rivers State Judicial Commission of Inquiry of looting ₦97 billion along with co indictees including a former army general. Saminu Turaki: Alleged to have looted ₦36 billion. First charged before Justice Sabi’u Yahuza of the Federal High Court in Dutse, Jigawa State. Currently facing trial before justice Nnamdi Dimgba at the FCT High Court. Timipre Sylva: A well known financier and supporter of the APC administration of President Muhammadu Buhari. Alleged to have looted ₦19.7 billion. Was facing trial before Justice A. Y. Mohammed of the Federal High Court, Abuja. However, two days after President Buhari was sworn in, the new APC government WITHDREW the charges preferred against Sylva on June 1, 2015 and on October 3, 2018, the EFCC returned to Sylva, 48 houses seized from him during the administration of former president, Goodluck Jonathan in 2013 to him. Senator Danjuma Goje: Alleged to have looted ₦25 billion. Currently facing trial before the Federal High Court, sitting in Jos, Plateau State. Senator Abdullahi Adamu: Alleged to have looted ₦15 billion with the help of 18 co accused. Charged on March 3, 2010. The case continues to linger in court. Orji Kalu: Alleged to have looted ₦3.2 billion. Currently facing trial before Justice Mohammed Idris of the Federal High Court sitting in Lagos. Kayode Fayemi: Indicted by the Ekiti Judicial Commission of Inquiry headed by former Ekiti State chief judge and the Oluyin of Iyin-Ekiti, Ademola Ajakaiye, of sundry financial malfeasance totaling over ₦2 billion. Senator Joshua Dariye: Alleged to have looted ₦1.2 billion. Currently facing trial before Justice Adebukola Banjoko at an FCT High Court. The lists are members of the APC who are currently indicted with no prosecution in sight. He wondered why the APC refused to explain to Nigerians that the President is a beneficiary of the funds allegedly stolen by the former National Security Adviser Colonel Sambo Dasuki. Transparency International had evaluated the Buhrai’s administration as more degenerate than the Goodluck Jonathan’s administration regardless of the war against defilement propelled by Buhari. Nigeria, in the current Transparency Corruption Index dropped 12 points in reverse from 136 148, a score the Presidency likewise couldn’t help contradicting. Amid Jonathan’s administration, Nigeria moved from 144 to 136 in 2014. This result addresses the genuineness of the anti-graft war by the present administration. The compromise by the present authority of the nation is another sign that it’s difficult to chomp the hands that nourish you as the Buhari’s government profited from the plundering of the past administration. Nigerians believe that their politicians are burglars without a weapon as their most prominent weapons are the pens. It isn’t clear if the reason for the open bold fight is the closeness to the 2019 Presidential election yet the administration of the day is by all accounts romancing with past PDP individuals who decamped to the ruling party while those still in the opposition camp are blamed for causing the 16 years misrule. It is obvious that the Nigerian government both former and current are neck deep into corrupt practices from the public display over the weeks. It’s perplexing that politicians are shameless to publicly accuse themselves with the exact amount they stole. It’s an indication that pilferage is no longer a “wow” crime, and it’s one of the many reasons the country, despite its huge natural resources, has refused to develop. Nigeria is a country where politicians yet to be caught publicly shame, ridicule politicians caught. The public battle has only showcased the dirtier pigs and it has reached the point of accepting the culture of shamelessness.